Your personal academic advisor will guide you every step of the way. Bridgeway Academy provides students and parents with a level of individualized attention, support, and customization that is unmatched in any other educational environment. Serve as your guidance counselor, an encourager, and a resource to turn to for tips and ideas. Serve as your organizer to help keep parents and students on track with accurate records. Analyze student placement testing and learning styles, and customize the homeschooling curriculum packages. Assist with curriculum decisions, provide support and encouragement throughout the school year, and manage record keeping. 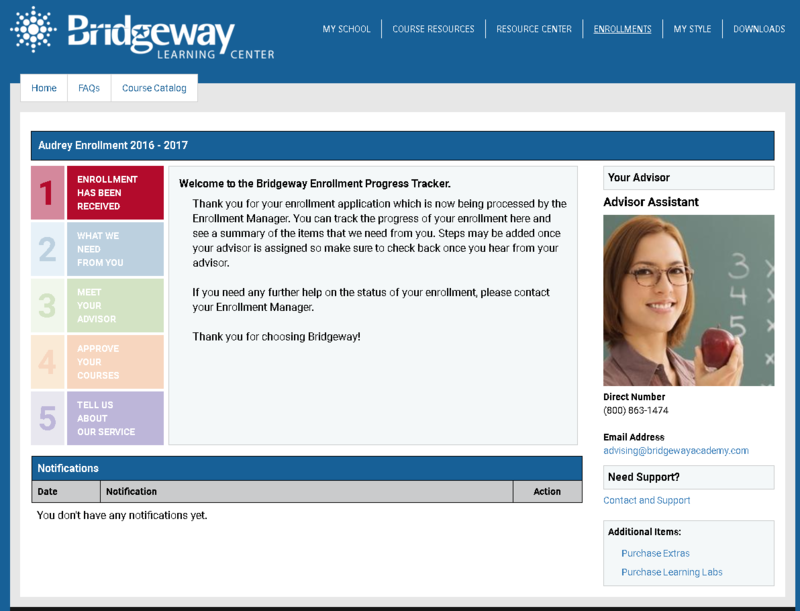 Your Bridgeway Advisor is just an email or phone call away. You will find your Advisor's contact information at the bottom of each you receive. You will also find this information in the Bridgeway Learning Center. After logging in, select Enrollments to see your advisor information. Parents will need to select a student after clicking Enrollments to see the advisor for each student.